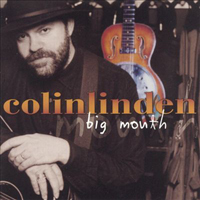 Colin Linden returns to the more acoustic feel of his earlier recordings. It is still plugged in and he uses many of the same players from his last two discs, yet it is still a subtler disc that maintains the fiery intensity for which he is known. with help from John Whynot for the Dinner Twins. First and Foremost, Thanks to my wife, Janice Powers for ongoing care and maintenance of my soul. Thank God I found you. Thank you John Whynot, for being there, and for continuing to pursue our communal vision with absolutely no regard for anything but what's important. Thank you Charlie Ferguson for keeping Bikoe well fed and keeping our lives together in the midst of chaos. Thanks Commander Tom Carrico for managing to keep us from capsizing! Thanks to my pal Keb' Mo' for being so professional that the folks will always go along for it. Thank you Lucinda Williams for making us laugh hard and keeping the Dinner Twins well fed. Thank you Lee Roy Parnell for coming out to sing when you were so incredibly busy. Thanks to Bruce Cockburn for your continuing inspiration, friendship and killer playing. Thank you Bernie Finkelstein for your unwavering support and believe, and for all the great Dim Sum. Thanks to Johnny, Gary & Richard for your patience, playing & plenty pigmeat. Richard, thanks for sleeping on a couch for a week and a half to play on this. Thank you T-Bone Burnett for getting me involved with "O Brother Where Art Thou?" Thanks King Williams & Barry McClellan for access to your great studios and your enthusiasm for this music. Thank you Ken Whiteley for the mics and all of the soul you put in them. Special thanks to Denise Donlan, Dave Quilico, Mike Roth, Don Oates, Sonia Sorensen, Greg Pappas, Catherine McRae, Tanya Nagowski and all the great folks at Sony Music Canada. Thanks for letting me do what I do. Thanks also to Andrew Mech & Warner-Chappell everywhere, the wonderful Jonell Mosser, Jessi Alexander, Bryan Owings, Sylvia Giannitrapani, Dave Rae, Todd Littlefield, Ann Forbes, Tamara Silvera, Graeme Whynot, Anders Osborne, Katie Dalton, Greg Calbi, Danielle Crisafulli, Gary Nicholson, Billy Block, Blackie & the Rodeo Kings (& Queens), Andy Scheinman, John Thibodeau, Paul Reddick, Sue Foley, David Wilcox, Morgan Davis, Ray Bonneville, Christie Friesen, Clark Miller, Chris Thomas King, Bonnie Garner, Deb Hamilton, Deborah Wagnon, Ken Fulghum, Mike Poole, John Warren & Keb' Mo' Band and crew, Jay Linden, Linda Hess, Paul & Edna at ETM, Rob Bowman, Larry Leblanc, Harvey Weinreib, Jeff Long and all at Long & McQuade Music, Angela Browne and all the Blockheads. Stay well Dr. Nerney and all of your family. Hey Rick Danko wherever you are, I can hear your voice from beyond the stars. Henry Thomas, Blind Willie McTell, Charley Patton, Son House, J.B. Lenoir, Sleepy John Estes -- you are all in these songs bigtime. This record is dedicated to Sam Chatmon, loved and remembered by me & the other BBQ Boys -- Doc, Terry & Dorcor Dave. Bruce Cockburn appears courtesy of True North Records. Lee Roy Parnell appears courtesy of Vanguard Records. Lucinda Williams appears courtesy of Lost Highway/Mercury Records. Keb' Mo' appears courtesy of Okeh/550 Records. Jonell Mosser appears courtesy of Siren Songs Records. CL & JW appear courtesy the Slimmer Twins.